AllSeated’s collaborative planning tools are perfect for arranging your wedding reception seating chart along with providing you the ability to easily organize and manage many other aspects of your wedding planning process. Within your AllSeated account, organize and manage your guest list, floorplans, wedding reception seating chart, timelines and more, all in one place! Create and manage your wedding guest list within your AllSeated account. Enter guest names and mailing addresses listed alphabetically or filter then into categories of your choice for even easier organization. For example, it may help you to filter your guests by friends, family, colleagues, college friends etc. to save you even more time when arranging your wedding reception seating chart. Keep notes, enter meal type information and track RSVP’s directly within your guest list. You even have the ability to group guests for wedding related events such as the bridal shower, rehearsal dinner, and post-wedding brunch. This will prove useful when when creating the reception seating chart as the process will be even more efficient when places guests within the reception seating layout. AllSeated gives you peace of mind when creating your wedding reception seating chart as all of our floorplans and furniture are built to-scale. Since one in every ten events is created within AllSeated, most venues already have their floorplans within our platform. If you cannot locate the floorplan for your venue within AllSeated, simply provide us with a floorplan marked with at least one accurate dimension and our team will scale and upload it into the platform for you. Easily design your wedding floorplan by choosing from a wide variety of table and furniture styles from AllSeated’s extensive object library. Customize the spacing between tables, the number of chairs around each table, and add table numbers. Aside from positioning the tables and furniture within the reception seating layout, you also have the ability to join tables and/or knock off chairs, as well as mark spaces for the dance floor, band, and other features within wedding reception seating layouts. Remember to include other details such as buffets, bars, and exits for the room. During the process of designing the floorplan, easily switch views from 2D to 3D to take a tour of your floorplan. Using AllSeated’s 3D tool, you are able to create a virtual walk through of your wedding guest seating layout! You can walk through the space in 3D as if you were actually moving through your wedding in 1st Person View or choose “Bird’s Eye View” which allows you to see your floorplan layout from above. Taking a virtual walkthrough of your floorplan using AllSeated 3D floorplan viewing tools helps to ensure that you’re 100% satisfied with the layout before the actual day of your wedding. Your guest list links directly to the seating section of your event which allows you to easily and efficiently arrange your wedding reception seating chart. Easily select each guest to assign them to a table with the option to assign guests to specific seats at a table, if desired. Simply select a guest from your guest list, and then click the table in the floorplan at which you want the guest to sit. It’s really that simple to create your seating chart for wedding reception! 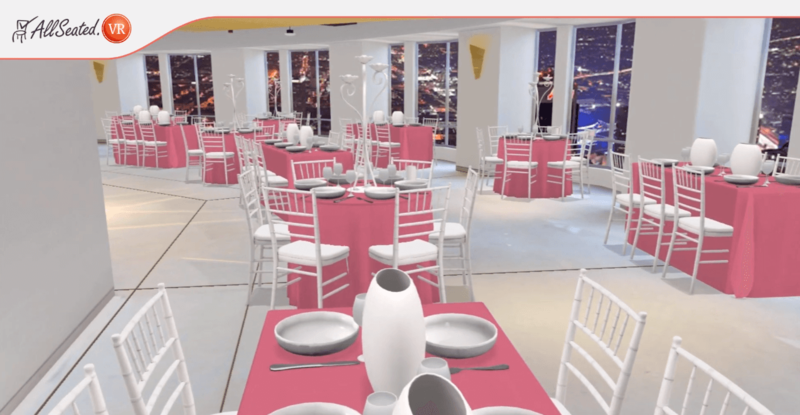 AllSeated’s special virtual reality goggles allow you to tour the 3D floorplan of your future wedding reception layout and wedding reception seating in a realistic simulation. Learn more about AllSeated’s Virtual Reality and the three easy steps for getting started here. AllSeated provides for easy collaboration regarding the details for your wedding. Invite family members and/or close friends into your account for assistance with guest information, opinions on your floorplan and advice on arranging your wedding reception seating chart. Collaborate with your planner, vendors, caterer, and venue too so that everyone is operating on the same page and up to date on details. While collaborating with others, you will always have the opportunity to set default permissions within your account so that you can control what can and can’t be edited. Create multiple timelines for your wedding day! In addition to creating a day of timeline for yourself to keep track of beauty appointments and your schedule of events leading up to the ceremony time, you can also create a vendor timeline. Vendor collaboration will keep everyone working from the same page regarding your wedding details. The vendor timeline will allow for vendors to understand the flow of set up, event details and the timing of break down at the end of the night. Timelines can be viewed side by side to offer even more organization! There are so many useful reports that can be generated from your AllSeated account. Create reports from both your guest list and floorplan which can be provided to your vendors for many useful reasons. For example, your floorplan report can dictate your desired layout along with your reception seating so that the room is set up the way you desire. Your guest list report can be broken down specifically to meet your needs for things like invitations, place cards and even personalized favors. AllSeated’s Day-Of Mobile App for tablets gives you access to your wedding on the go with a full check-in system including real-time collaboration, live check-in updates, overview of check-in status and ability to view your floorplans and wedding reception seating chart in both 2D and 3D. AllSeated VR technology is event industry’s first/only genuine virtual reality capability. AllSeated’s VR offers seamless, photorealistic 3D renderings, sending customers on a virtual walkthrough of reception seating layout from anywhere in the world. If a venue is equipped with AllSeated VR, visitors can virtually tour the layout using either the venue’s website widget or a VR headset. This allows wedding couples to preview their tables and furniture, and even view a custom setup in virtual reality to achieve photorealistic immersion into the venue months before their event takes place. Learn more about AllSeated’s VR in this video!